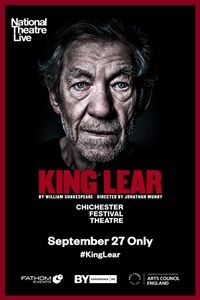 Synopsis: Captured live from London's West End, see Ian McKellen's 'extraordinarily moving portrayal' (Independent) of King Lear in cinemas nationwide on Thursday, September 27 at 7:00 p.m. local time. Considered by many to be the greatest tragedy ever written, King Lear sees two ageing fathers - one a King, one his courtier - reject the children who truly love them. Their blindness unleashes a tornado of pitiless ambition and treachery, as family and state are plunged into a violent power struggle with bitter ends. Jonathan Munby directs this 'nuanced and powerful' (The Times) contemporary retelling of Shakespeare's tender, violent, moving and shocking play.